NASA Administrator Charles Bolden said Tuesday that cooperation with Russia on the International Space Station has not been disrupted by rising diplomatic tensions over the crisis in Ukraine. "Right now, everything is normal in our relationship with the Russians," Bolden said. "I think people lose track of the fact that we have occupied the International Space Station now for 13 consecutive years uninterrupted, and that has been through multiple international crises," he said. "I don't think it's an insignificant fact that we are starting to see a number of people with the idea that the International Space Station be nominated for the Nobel Peace Prize. It's not trivial." Bolden urged Congress to fully fund development of commercial manned spacecraft to end U.S. reliance on Russia to ferry astronauts to and from the space station. He said the Obama administration's $17.5 billion budget request for NASA in fiscal 2015 will maintain American leadership on the high frontier. Since the retirement of the space shuttle in 2011, and in the absence of earlier funding to develop a follow-on manned spacecraft, NASA has been dependent on the the Russians to launch crews to the space station aboard three-seat Russian-built Soyuz spacecraft. Under a series of contracts with Roscosmos, the Russian federal space agency, NASA has paid between $50 million and $70 million per seat for U.S. astronauts and partner crew members representing Japan, Canada and Europe to hitch rides aboard Russian ferry ships. As part of a new space policy implemented by the Obama administration in 2010-11, NASA is overseeing a competition to develop a commercial American manned spacecraft to restore independent access to space. The administration asked for $850 million for commercial manned spaceflight in its fiscal 2012 budget request, but Congress approved just $397 million, a cut that pushed the first NASA flight to the station back one year to 2017. The administration requested $830 million in its fiscal 2013 budget. Early debate in the House called for limiting the scope of the contract to a single company but a compromise eventually was reached that would provide $525 million. NASA received $696 million for commercial crew operations in fiscal 2014. The fiscal 2015 request for commercial crew is $848 million, with another $250 million available from the Obama administration's Opportunity, Growth and Security Initiative. NASA plans to award development contracts to one or more competitors in late summer, and test flights could begin as early as 2015. But Bolden warned that full funding is required to avoid additional delays. "Let me be clear about one thing," Bolden said. "The choice here is between fully funding the request to bring space launches back to the U.S. or continuing millions in subsidies to the Russians. It's that simple. The Obama administration chooses investing in America, and we believe Congress will choose this course as well." As for the crisis in Ukraine, Bolden said NASA is pressing ahead with its normal schedule of joint activity. 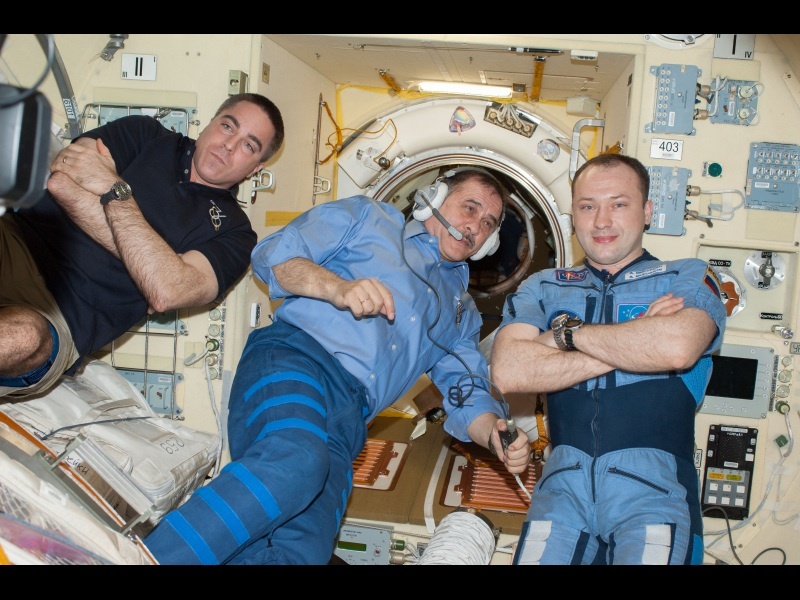 Three members of the station's current six-man crew -- commander Oleg Kotov, Sergey Ryazanskiy and NASA astronaut Michael Hopkins -- are scheduled to return to Earth next Monday, landing in Kazakhstan aboard the Soyuz TMA-10M spacecraft. Their replacements, Soyuz TMA-12M commander Alexander Skvortsov, Oleg Artemiev and NASA astronaut Steven Swanson, are scheduled for launch March 25 from the Baikonur Cosmodrome. Asked if the high-stakes drama in Ukraine was prompting any contingency planning, Bolden said "we continue to monitor the situation. You know very well that foremost in our minds is the safety of our crews and our assets. That has not changed." While NASA engineers and flight controllers constantly update contingency plans for in-flight emergencies or malfunctions, Bolden said that so far, no such planning was required as a result of the crisis in Ukraine. "In terms of the situation on the ground, we will go into contingency planning as the situation dictates," he said. "But right now, we don't see any reason to be doing so." He did not address what sort of planning might be possible in the absence of a NASA-operated manned launch-and-entry vehicle. But the station cannot be safely operated by either party on its own and cooperation is required. NASA's 2015 budget request supports the Obama administration's recent decision to keep the station flying through at least 2024. The budget request includes $3 billion to support the International Space Station in fiscal 2015, $2.8 billion to continue development of a new heavy-lift booster and Orion crew capsule for deep space missions and $4.9 billion for space science. Science spending includes $1.8 billion for Earth science to improve forecasting and climate modeling; $1.28 billion for planetary science; $607 million for astrophysics; $669 million for solar research and observation; and $645 million to continued development of the James Webb Space Telescope, the long-awaited, long-delayed and over-budget successor to the Hubble Space Telescope. Launch remains planned for October 2018. The planetary science request covers ongoing development of multiple Mars missions, including a 2020 lander modeled after NASA's Curiosity rover, and the continued operation of currently operating planetary missions, including Curiosity, the Opportunity rover, two Mars orbiters, the Messenger mission to Mercury, the Jupiter-bound Juno spacecraft, the New Horizons spacecraft en route to Pluto and the Cassini spacecraft in orbit around Saturn. But funding for the Stratospheric Observatory for Infrared Astronomy, or SOFIA, a sophisticated infrared-sensitive telescope carried by a modified 747 jumbo jet, would be sharply curtained "due to its high operating cost and budget constraints." The Obama administration's proposed Asteroid Redirect Mission, or ARM, would receive $133 million in fiscal 2015. The project is focused on robotically capturing a small asteroid and towing it back to the vicinity of the moon for hand-on exploration by astronauts launched aboard the Orion crew capsule. The ARM mission is part of a broader initiative intended to help NASA learn more about astroids in general, improve the agency's ability to detect potentially threatening asteroids and, at some point, learn how to deflect or destroy an approaching body. NASA planners hope to launch a manned astroid mission in the mid 2020s with the long-range goal of sending humans to Mars in the 2030s. "This budget ... ensures that the United States will remain the world's leader in space exploration and scientific discovery for years to come," Bolden said. "It also supports the administration's commitment that NASA be a catalyst for the growth of a vibrant American commercial space industry. "We're working to send our astronauts to the International Space Station. ... The budget supports this crucial work and keeps us on target to launch American astronauts from right here in the USA by 2017. At long last, this will end our reliance on the Russians to get into space and free us up to carry out even more ambitious missions beyond low-Earth orbit."